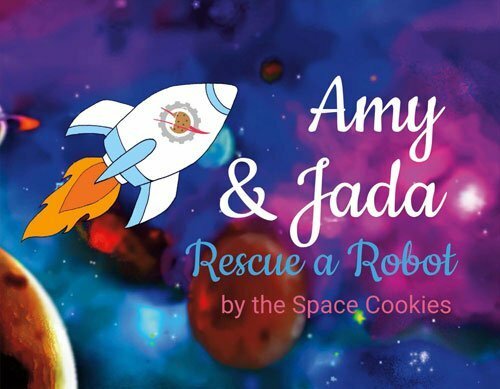 June 18 was an exciting day for the Space Cookies when our children’s book, Amy & Jada Rescue a Robot, was officially launched! Amy & Jada tells the story of two young girls who embark on an intergalactic quest to fix a broken robot named Tinker. After visiting three planets to collect all the parts needed to repair their new friend, Amy and Jada return to Earth and successfully make the necessary repairs. Amy & Jada was written and illustrated by the Space Cookies with the goal showing young readers that girls can be highly capable engineers. Our book is now available for sale with many major book retailers including Amazon and Barnes & Noble. We have held several book readings and can’t wait to hold more!